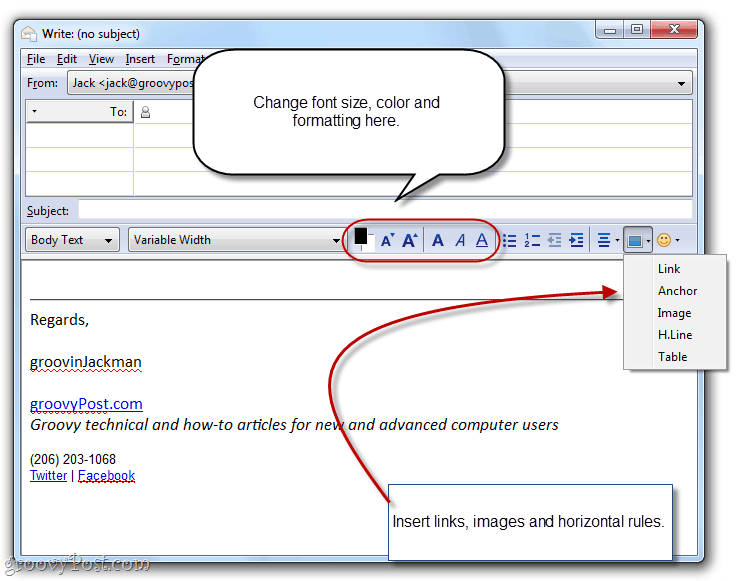 Create a new blank message in Thunderbird by clicking Write. We’re not actually going to be sending an email here, we’re just using this message as a workspace. 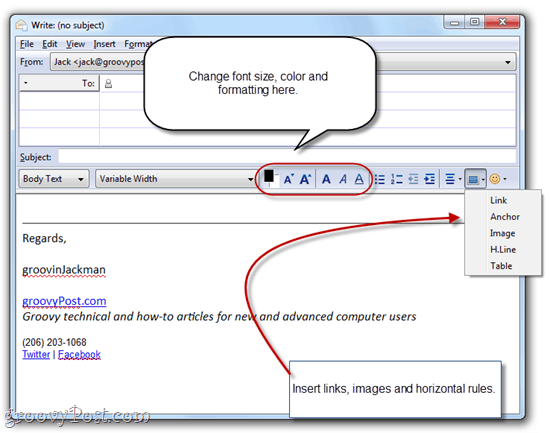 Type out your signature and format it using the formatting toolbar in the composition window. Make everything just like you want it to look in your signature. Personally, I like to include an image in my signature. If you’re pretty enough, you could even include a headshot, but lookin’ good isn’t really my department, so I’m going to use a logo. There are two ways to do this: attach it or embed an image on a web server. 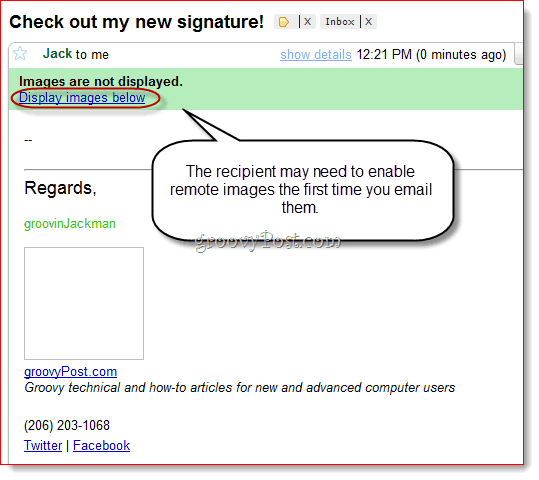 If you attach it, then every single email you send out will have your signature image attached. This’ll add a few KBs to your file size, which may or may not be an issue for you. But the real drawback is that your recipients will never know if you actually sent them an attachment other than your signature image. I don’t really like that, so I usually opt for the remote hosted image. The drawback of that is that, by default, most web clients block remote images. But once you start emailing someone regularly, they can start accepting remote images, so really, that’s only an issue for your first message. 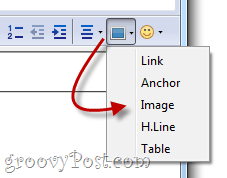 Anyway, to insert an image, click the Insert button in the formatting tool bar and click Image. 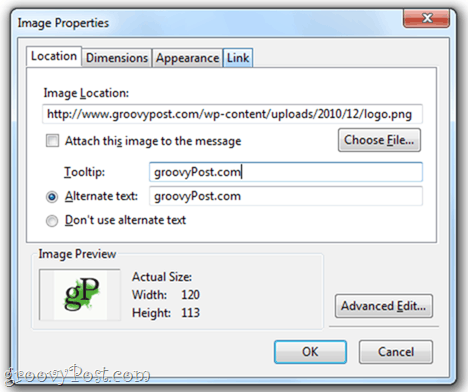 If you’re attaching your image, you can simply browse for it by clicking Choose File… If you’re using a remote image, copy and paste the location into the Image Location field. You can also add alt text and tooltip text, if you’d like, or you can select Don’t use alternate text to forgo this. You’ll also probably want to include a link. To create a hyperlink, highlight the text you want to use as your anchor text and click the Insert button and choose Link. Type in the destination URL and click OK. I don’t recommend attaching the source of the link to the message. 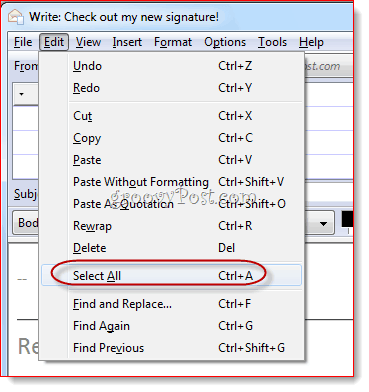 Once you have your signature just the way you like it, click Edit and choose Select All (or press CTRL-A on your keyboard). This will select all the text. 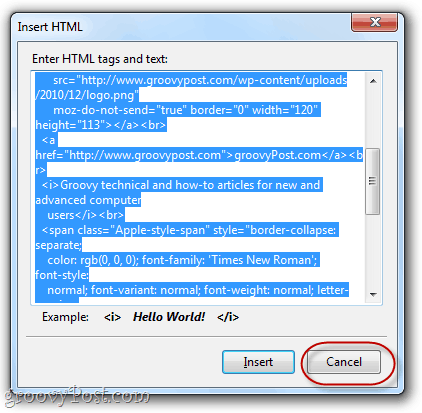 Click the Insert menu and click HTML. This will show a dialogue box that has the raw HTML code for the signature that you just created. 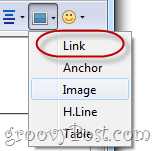 Press CTRL-A and then CTRL-C to copy the raw HTML code to your clipboard. Click Cancel. 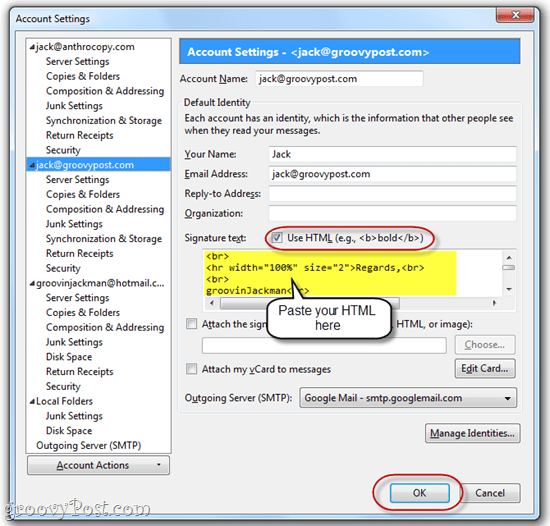 Click Tools and choose Account Settings. 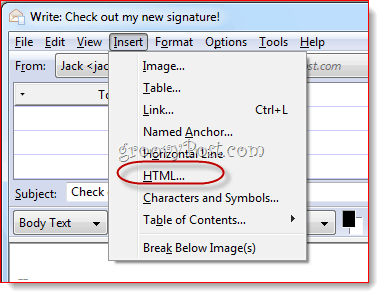 In the box below Signature text, paste your HTML code. Make sure Use HTML is checked and click OK.
Now, when you compose a new message, your custom HTML signature will already be inserted. Remember that if you’re embedding an image from a remote site, the recipient may have to enable images from your email address before they can see your logo. That’s certainly not the only way to get a rich text HTML signature into Thunderbird, but in my opinion, it’s the easiest, especially for those who feel daunted by raw HTML code. With this method, you can create your signature in a WYSIWYG (what you see is what you get) manner and save it for future use. Thanks for your help, its working great. Fantastic, you don’t know how long this has been on my list of things to do. THANKYOU!! This is a brilliant tutorial – I don’t usually have a go at anything like this but I have just managed to insert my signature with a working link to my little self catering holiday cottage business- it was so easy and no tears! same here. and sadly, i’ve been with the company for 3 months and I just now figured it out (with your help!) THANK YOU! Thanks a lot for this fantastic suggestion. You saved my day !! To put it simply: After going through this tutorial, I’m signing up for your newsletter! Thank you! Very cool hint. Thanks so much! THANKS! I have worked for weeks looking for a way to do this and you made it so simple. Thanks very much for your clear steps outlining what to do. It took me hours of trial and error until I found your how to do steps. …now if I can just figure out how to control how it looks to my client, since it appears in a different font on her computer than it does on mine, in Thunderbird as well as in Mac Mail…. Awesome tute pal! Great work! Thabnks! how do I add twitter and Linkedin to the signature? Perfect solution and super easy. Thanks. Thank you Jack for sharing this great tutorial. I’ve tried many different ways on how to do this and your step by step tutorial works great and so easy to follow. BTW, how do you get rid off the dash line above the Signature? I am using Thunderbird/3.1.20 on iMac. Thanks a lot. couldn’t figure it out from mozilla’s instructional…. me thinks they should borrow yours. Thank you for posting this. It made my email signature look great! I have spent few times fixing the problem, this time is easy fix. Wow! You are awesome. Thank you so much. That was immensely helpful. Hi Did what you said and work great, but when I reply a message some icons from my signature are gone..Please let me know if you have an idea>.. Fantastic! I was trying to do this for ages and faiing miserably. Thanks. That is quite simply the clearest, most elegant how to link I have ever come across. Thank you. I follow nothing but will now bookmark your site. Brilliant. Thank you, this was SO easy! Simply amazing! To echo everyone else, THANK YOU! Thank you so so much – it works and looks great. It also was really easy!!! Many thanks, this is want I was looking for since a long time! seriously, couldnt ever figure out. couldnt have done without your help. thank you very much! Many thanks. Very easy and simple to follow. I notice in your signature that there are two little dashes, same thing shows up in mine – any way to eliminate them? I tried re-composing my signature but they keep showing up. Anyway, thanks for this thorough and clear tutorial! I have just created my new signature using HTML but two dashes appear above the new signature – even though they aren’t in the HTML coding. 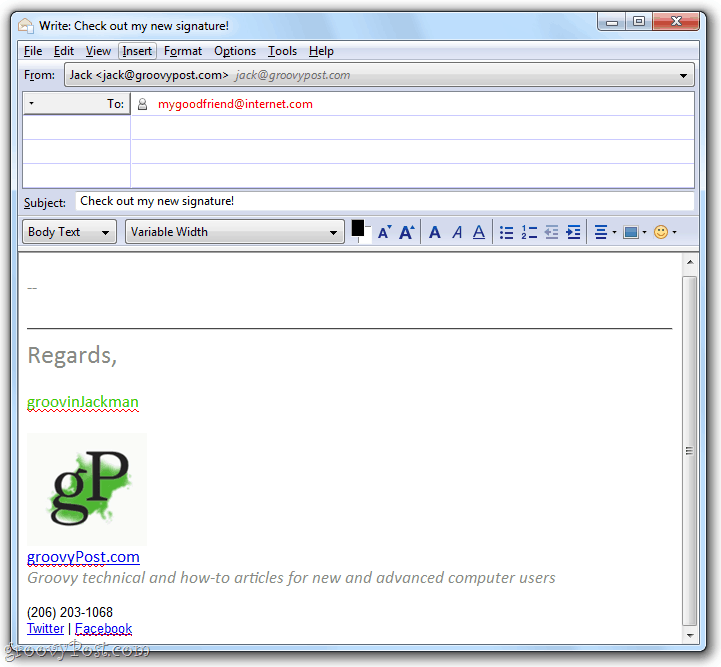 I tried but in my Thunderbird, In Email Setting i dont see Signature text to copy the HTML code ??? “Signature Text : use HTML…” is checked. Thanks buddy. I was looking for something like this for long. Brilliant Jack! This saved me hours trying to work this out through Thunderbird whose Help is pretty basic. Much appreciated mate. THANK YOU! THANK YOU! THANK YOU! I’ve spent hours trying to figure this out for the past 6 months! I cannot believe how easy it is to do WITHIN Thunderbird! Your Thunderbird advise worked, thank you for posting it. Wow! Thanks to you I was able to have my e-mail signature back. I tried other ways and it was so complicated and it didn’t work. Your explanation was easy to follow and it works great; thank you!!! Thanks! This is a great help. So easy with your step by step instructions. Thanks so much! It works great ! Thank you so much !! So easy I wish I had seen this before the other 13 websites! Thanks a lot. 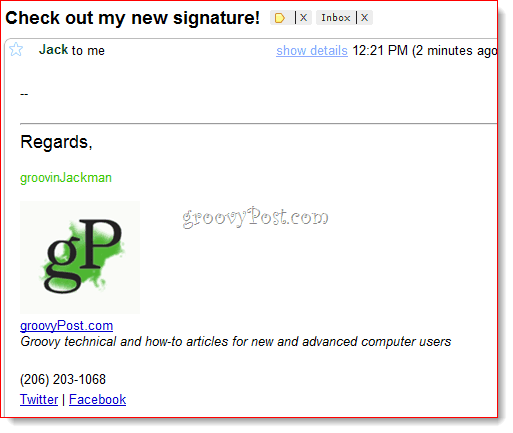 How do you get the signature to show up automatically when replying or forwarding a message? Using Mac. Well done! I was about to give up on ever getting a good looking signature into Thunderbird. This would add the external links though wouldn’t it? Do they get disabled by email handlers? Thanks!! I’ve been trying to do this but couldn’t figure it out!! Blessings! This was exactly what I was looking for! Thank you for making it so easy! Thank you very much, very informative and simple. Excellent instructions. 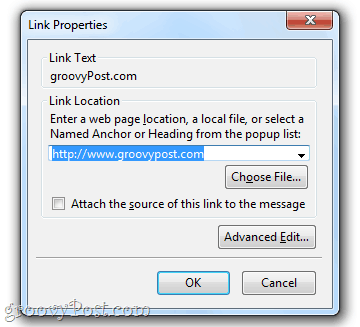 Open a new message, add text, links, images – edit it as you want. This will save the message as html file that can be chosen for a signature in given account settings. Plus of having it on file is that if you want to set mail accounts anew, it’s easier to point to a proper file and you can edit or view it on another program if needed.